Residents of Salzburg, Austria have an unusual and morbid fascination with death. So much so that many citizens keep a separate bank account that will be used to send them off to eternity in style. Perhaps that is one reason why St. Sebastian Cemetery is one of the most visited sites in all of Austria. Situated in Salzburg, the fourth largest city in Austria, it is located besides the charming St. Sebastian's Church on Linzergasse street. The cemetery is eeriely morbid with its many ghoulish features. Many tombs and mausoleums are adorned with fire breathing dragons, slithering snakes, crumbling bones, demonic symbols, and skulls and skeletal art. Many graves are purposely decorated with moss, ivy, and other dark vines which terrifies and fascinates visitors. St. Sebastian's has the distinction of being the final resting place of Amadeus Mozart and many members of his family including his father Leopold. 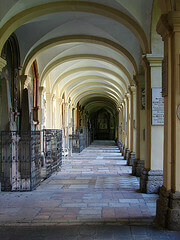 It also houses the physician known as Paracelusius and many Austrian royals and nobles. So the next time you are in Salzburg plan a visit to St. Sebastian's and thank your lucky stars you are above ground to appreciate its uniqueness. Last updated by Randy Taylor on 27 November, 2009 in Destinations.